This guide includes a tutorial about Evidence-Based Practice (EBP) in Health, a Reference Shelf of supporting eBooks, and a Toolkit of online sources of evidence. The Evidence Hierarchy: What is the "Best Evidence"? Systematic Reviews versus Primary Studies: What's Best? Systematic Reviews and Narrative Reviews: What's the Difference? What is "the best available evidence"? The hierarchy of evidence is a core principal of Evidence-Based Practice (EBP) and attempts to address this question. The evidence higherarchy allows you to take a top-down approach to locating the best evidence whereby you first search for a recent well-conducted systematic review and if that is not available, then move down to the next level of evidence to answer your question. The process of a rigorous systematic review can take years to complete and findings can therefore be superseded by more recent evidence. The methodological rigor and strength of findings must be appraised by the reader before being applied to patients. If a current, well designed systematic review is not available, go to primary studies to answer your question. The best research designs for a primary study varies depending on the question type. The table below lists optimal study methodologies for the main types of questions. Note that the Clinical Queries filter available in some databases such as PubMed and CINAHL matches the question type to studies with appropriate research designs. When searching primary literature, look first for reports of clinical trials that used the best research designs. Remember as you search, though, that the best available evidence may not come from the optimal study type. For example, if treatment effects found in well designed cohort studies are sufficiently large and consistent, those cohort studies may provide more convincing evidence than the findings of a weaker RCT. It addresses a focused, clearly formulated question. Systematic reviews may or may not include a meta-analysis used to summarise and analyse the statistical results of included studies. This requires the studies to have the same outcome measure. Filtered information appraises the quality of a study and recommend its application in practice. The critical appraisal of the individual articles has already been done for you—which is a great time saver. Because the critical appraisal has been completed, filtered literature is appropriate to use for clinical decision-making at the point-of-care. In addition to saving time, filtered literature will often provide a more definitive answer than individual research reports. Examples of filtered resources include, Cochrane Database of Systematic Reviews, BMJ Clincial Evidence, and ACP Journal Club. The Cochrane Collaboration is an international voluntary organization that prepares, maintains and promotes the accessibility of systematic reviews of the effects of healthcare. The Cochrane Library is a database from the Cochrane Collaboration that allows simultaneous searching of six EBP databases. Cochrane Reviews are systematic reviews authored by members of the Cochrane Collaboration and available via The Cochrane Database of Systematic Reviews. They are widely recognised as the gold standard in systematic reviews due to the rigorous methodology used. Abstracts of completed Cochrane Reviews are freely available through PubMed and Meta-Search engines such as TRIP database. National access to the Cochrane Library is provided by the Australian Government via the National Health and Medical Research Council (NHMRC). 2. Hoffman, T., Bennett, S., & Del Mar, C. (2013). Evidence-Based Practice: Across the Health Professions (2nd ed.). Chatswood, NSW: Elsevier. 4. Davidson, M., & Iles, R. (2013). Evidence-based practice in therapeutic health care. In, Liamputtong, P. (ed.). Research Methods in Health: Foundations for Evidence-Based Practice (2nd ed.). South Melbourne: Oxford University Press. 5. Cook, D., Mulrow, C., & Haynes, R. (1997). 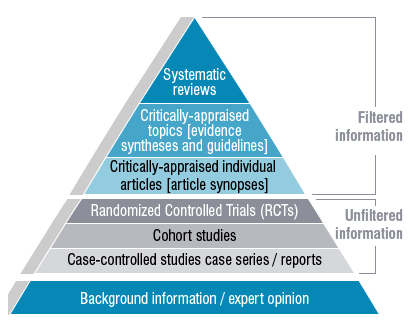 Systematic reviews: synthesis of best evidence for clinical decisions. Annals of Internal Medicine, 126, 376–80.